A leaked image of the full GTA V map was posted earlier today. 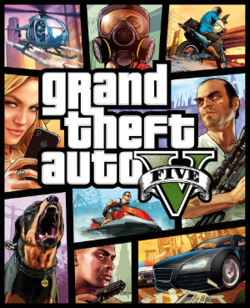 The map shows the game’s playable area, including the city of Los Santos and the rural expanses of Blaine County. It's believed that the image is taken from GTA V's strategy guide. Country roaming played a huge part in the last game to be set in the state, Grand Theft Auto: San Andreas, and sees the return of many of its landmarks like Los Santos International Airport and Mount Chiliad. GTA V launches on September 17th. Just in case you (somehow) forget, you can remind yourself through our awesome new calendar. You can set yourself a reminder by simply clicking the button on the left of the calendar. If you're viewing this through AppyGamer, you may need to come to our website to see the calendar link. Let us know your thoughts and opinions in the comments, below!